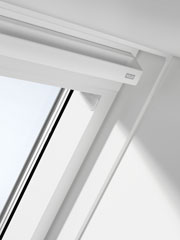 Not only standard, but also other sizes and VELUX Cabrio windows, VELUX window for a balcony are available. Moreover, we can offer all the accessories for VELUX production, as an international VELUX does. It goes without saying, we can offer many opening types, roller blinds, handles, automatic openers, for example – VELUX Integra. Additionally, several colours to pick from and many types of glass packages are available. As a matter of fact, we have an economic type – VELUX GZL for a reasonable price! Important to say, that all production is very well and properly packed, so we are always sure about the safe delivery. Installation instruction always follows the package. Customers who prefer a natural wood colour from inside, which looks natural, we offer varnished ones. Correspondingly, if You prefer a white colour, we can offer VELUX with polyurethane cover or just painted white. The polyurethane cover gives extra water protection. Apart from this, it is well maintained product. Now the most popular opening type for VELUX is middle axle (“midhengslet”) and a handle on the top/bottom (if needed). Also possible to open windows from the top – it is “panoramic” type opening, often called as a „fire escape“ type (“top hengslet”). Similarly, VELUX has great options for a flat roof, also VELUX Cabrio windows GDL and roof terrace, sun tunnels as well. We always recommend buying VELUX production with a montage gasket set: BDX, BFX and BBX isolations. Of course, if customer requires a complete finish from inside, (“furing”) is included. With all assembling system in package You always will find instruction and recommendations for instalment. Customers, who want to get an offer, should let us know several things: size of the window, opening type, colour from inside, roof type (flat or tiles). After this we can make an offer immediately.